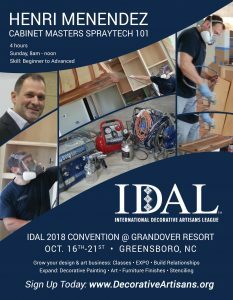 Learn industry-leading skills and techniques in cabinet, door, and furniture finishing and refinishing. These highly acclaimed and much in demand workshops usually fill up quickly. Register below to reserve your place. Our next classes will be held in High Point, North Carolina. 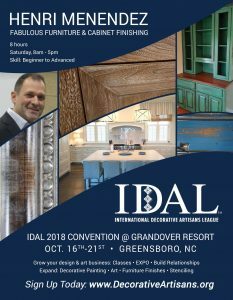 Learn the multi-faceted skills and techniques to distress, stain, tone, paint, glaze, and all around refinish furniture & cabinetry. 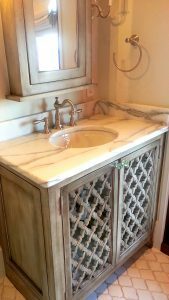 Many techniques shown which can easily be performed on either furniture or cabinetry. Will cover the repair, care, and materials used for furniture finishing and creating fine cabinet finishes. 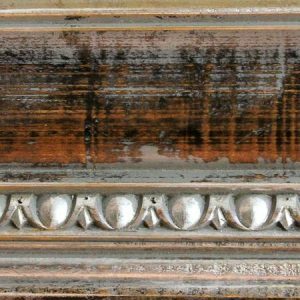 This lecture/demo will give you the knowledge and confidence you need to add high quality sprayed finishing to your repertoire. Even if you’ve sprayed before, you’ll learn all the tricks of the trade for proper technique, improve speed, ventilation methods, masking, maintenance, and more. Pros and Cons of all the latest equipment from HVLPs and Gravity feeds to Airless and Air Assists. Know before you come . . .
For many years my crew and I have tried and tested countless methods, materials, and equipment in an effort to improve our efficiency, production, and profitability. By constantly tweaking our approach and making the necessary changes to improve our system we have had much succes in the cabinet and furniture finishing sector. Completing over 1,200 cabinet refinishes, I’m pleased to bring you a wealth of knowledge and experience that would take you years to attain. While I’ve never claimed to have the only method or even the best method as it is always evolving and progressing, I can assure you this, that this system is tried and tested and when followed properly you will have greatly improved your quality, output, and most important, your profits!! That being said, It’s important that you have an open mind to things and techniques that maybe you’re not accustomed to. Maybe some materials or methods make you down right nervous or uncomfortable. That’s alright. This area of painting is very different from house painting and faux finishes. So again, for those two days at least, be open minded, relax, soak in as much as you can and enjoy. 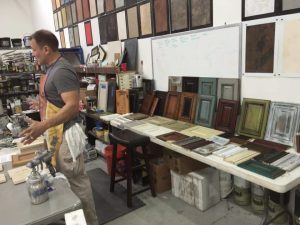 The class will cover cabinet finishing from A-to-Z. We will leave no stone un-turned. Not just all the tricks of the trade that will save you time and make you money but the little things that can affect your work and turn average painting in to top notch cabinet finishing. We’ll cover all types of spray equipment, techniques, maintenance, production work. We’ll also cover a wide range of materials and coatings with information on suppliers and brands. There will be plenty of hands on practice and use of equipment and technique. Also we’ll be using both catalyzed lacquers (solvent based) and waterborne lacquers (contradiction in terms, but we’ll explain). Some of the techniques and finishes we will be covering are TONING, CERUSED, GLAZING, RUBS, and many, many more. To fully understand cabinet finishing you must learn as much as you can about it and that means knowing all the products, surfaces, and methods used. Whether you plan to ever use lacquer or even a sprayer, you owe it to yourself to understand these elements of the business so that you can provide clients with the proper knowledge to make an informed decision on what you’re selling them. I know you will get a great deal out of this class and that will help your businesses to thrive! !